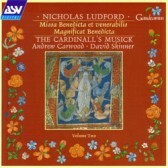 In this the second disc devoted to the works of Nicholas Ludford, the Missa Benedicta could not be more contrasting to our first issue. In the Missa Videte miraculum, Ludford uses two equal treble parts: in the Missa Benedicta he uses two equal low bass parts – again almost unique in this period. The Mass has a dark, sonorous, brooding quality which is offset by the chant for the Feast of the Assumption. The Magnificat Benedicta shares the same scoring and motifs as the Mass.